The endoplasmic reticulum (ER) protein GT1 (UDP-glucose: glycoprotein glucosyltransferase) is the central enzyme that modifies N-linked carbohydrates based upon the properties of the polypeptide backbone of the maturing substrate. 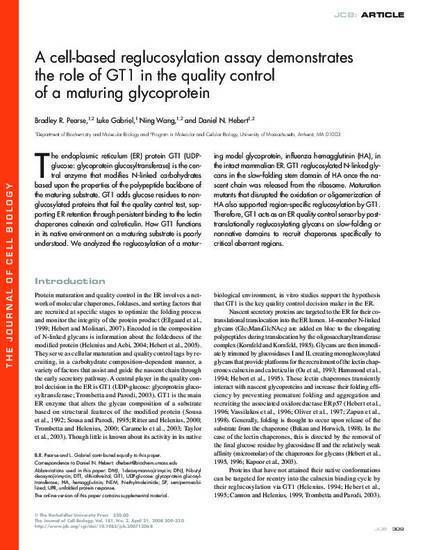 GT1 adds glucose residues to nonglucosylated proteins that fail the quality control test, supporting ER retention through persistent binding to the lectin chaperones calnexin and calreticulin. How GT1 functions in its native environment on a maturing substrate is poorly understood. We analyzed the reglucosylation of a maturing model glycoprotein, influenza hemagglutinin (HA), in the intact mammalian ER. GT1 reglucosylated N-linked glycans in the slow-folding stem domain of HA once the nascent chain was released from the ribosome. Maturation mutants that disrupted the oxidation or oligomerization of HA also supported region-specific reglucosylation by GT1. Therefore, GT1 acts as an ER quality control sensor by posttranslationally reglucosylating glycans on slow-folding or nonnative domains to recruit chaperones specifically to critical aberrant regions.